Well, from a business point of view we are tying up the loose ends, meeting with valuable associates and contacts for a glass or two, readying ourselves for a good 2014 and generally winding down. From a personal point of view, we are winding up for the Festive Season and here in Tuscany a very good time will shortly be had by one and all. Last Wednesday I spotted a lonely little Christmas tree in the Coop that needed a good home, so as one does, I carefully popped it in the car and brought it home. For years we have had gigantic trees, often as tall as fifteen feet high, but this was when we had properties of equal size. We once lived in a converted barn that had an entrance hall about twenty feet high and I bought a tree to fit it. Unfortunately, I got to the top of the ladder with the fairy and froze, having completely forgotten that I had no head for heights! My man was fortunately in the house and eventually rescued me. He also once rescued me in the pacific Ocean when I was snorkeling over a coral reef. I suddenly found myself floating over a bottomless watery canyon and panicked! I have to say, my man is my eternal saviour, and it’s not just his commando training, it’s also his amazing stamina when it comes to living with an eccentric writer for donkey’s years! Back in our local village of Fiano, I spotted a notice about the Christmas Carol Service on 22 December pinned to the front of Laura’s counter and my man has agreed to go. This will be the first time that we have done this in Tuscany and whilst we are not religious, I do miss singing carols. I also happen to know all the words, however, only in English so I hope that our lovely locals will not mind too much as I am their local ‘famous’ writer. This Friday we will be going into Florence for some festive cheer, lunch and maybe some shopping. I have pretty much finished the present shopping and got most of it locally. I do like to support the local shops as, unlike the UK, the huge department stores have not yet taken over the high streets. It is probably only a matter of time, but for now we can enjoy life the way it used to be in England thirty years ago. 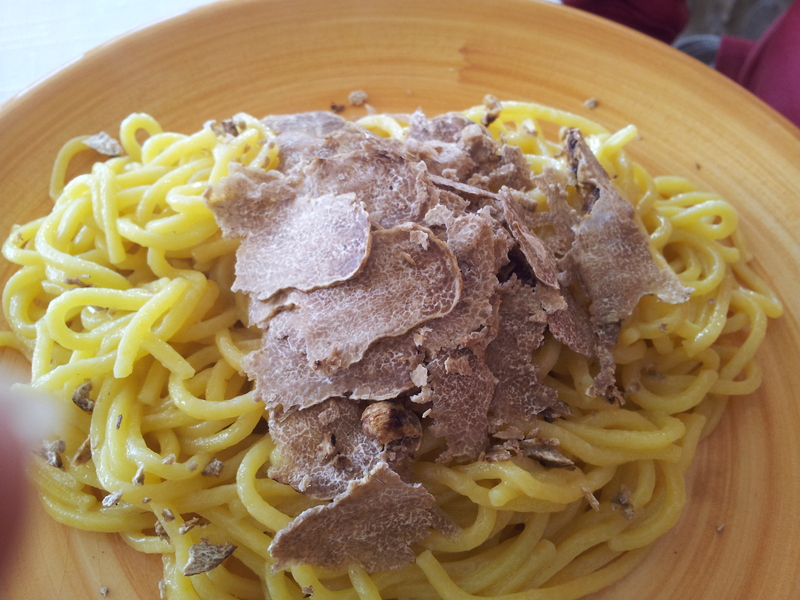 Before we head into the Festive Gastro season, just a mention that Tartufo Bianco (white truffles) is still being served at ‘C’era una Volta’ our local ristorante in Lucardo. For how much longer it’s hard to tell, but I have added a photo to make your mouth water! Well, I am afraid I must cut things a little short this time as it is already Monday and I have to clear my desk before we can relax for the festive season. I’ll update you on Silvio next weekend. Before I forget, I am currently reading ‘Christmas at Carrington’s’ by my good friend Alexandra Brown. If you like romantic festive girliness, you’ll love this book and can find it on Amazon. You will also find my own book ‘My Father, The Assassin’ by J W Finnigan on Amazon, which is a Romantic Thriller. If you prefer to download the E-book go to http://www.firstchapters.com where you can currently get a huge discount. Have a very good week and I’ll see you next weekend.